Evergreen perennial; stems horizontal, long-creeping, branched; erect branches with numerous leaves, 10-25 cm tall. Linear, 3-5 mm long, entire, with tips bending back to the stem, the tips usually with long white hairs. 2-6 cm long, 2-5 at the end of long stalks. Dry to moist open places, forest clearings, roadcuts, forests, heath and bogs in the lowland and steppe to subalpine and rarely alpine zones; frequent throughout BC, infrequent in SC BC; cosmopolitan, N to AK, YT and NT, E to NF and S to WV, MI, WI, MT, ID and N CA; Europe, Asia, Africa, S America. 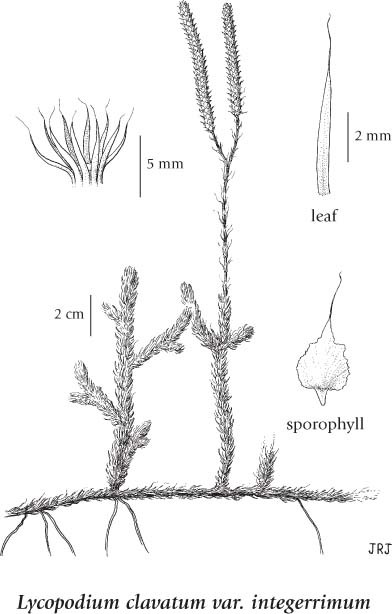 A shade-tolerant/intolerant, submontane to subalpine, circumpolar club-moss (trans­continental in North America). Occurs on moderately dry to fresh, nitrogen-poor soils. Widespread on water-shedding sites in boreal, cool temperate, and cool mesothermal climates; its occurrence increases with increasing latitude. Common in open-canopy coniferous forests; often inhabits decaying wood, persists on undisturbed cutover areas. Grows with Hylocomium splendens, Pleurozium schreberi, Ptilium crista­castrensis, and Rhytidiadelphus loreus. An oxylophytic species characteristic of Mor humus forms. 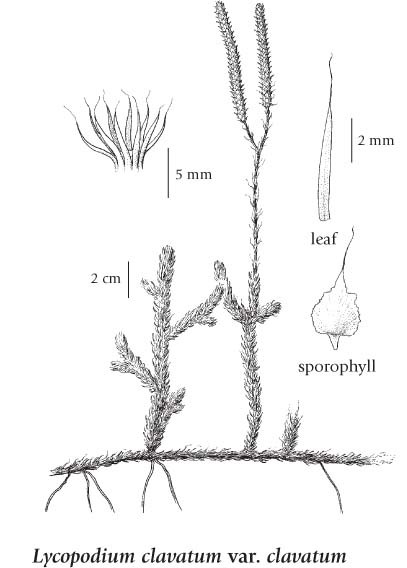 Lycopodium clavatum subsp. monostachyon (Hook. & Grev.) Seland. Lycopodium clavatum var. monostachyon Hook. & Grev. Lycopodium clavatum var. tristachyum Hook.